3D printing is a technology that is revolutionizing the way many people face design problems. With 3D printers you can create all kinds of products and objects, although at the consumer level can be used more to make small arrangements. But 3D printing has several basic problems. According to MIT the current problem with 3D printing is that it is very slow, it can only print small products and the materials used are very poor quality when having to be fused. To improve this technology have created what they call Rapid Liquid Printing, which can create products in minutes using rubber, foam, plastic or any liquid industrial product, without the problem of gravity destroying it. Essentially it’s about creating a 3D printer as big as you want, but use a large tank filled with gel to print inside. This gives you a base to print without having to add fasteners to hold the object until it solidifies, if in this subjection the plastic lines would fall down. This technique was created at MIT together with office furniture manufacturer Steelcase and materials researcher Christophe Guberan. 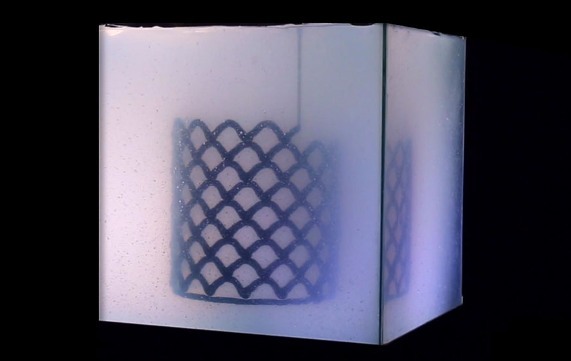 The gel creates an area without much gravity where the material to be solidified is kept in suspension and with the thickness and shape that is required, with no more help than a long needle that injects the product. Objects can be created by injecting these products in any direction and without fear of collapse of the final product, allowing them to create any idea quickly and also saving material in the process. This type of printing could be a new way to print 3D objects apart from the traditional plastic injection. MIT has created the first objects with the help of furniture designer company Steelcase, whose first physical result has been the basis of a table. Although with 3D printing there are few limitations, this system has eliminated some of the barriers to creating fast projects or even final products. The froth hardens more rapid, allowing creating final products concerning a few hours. There is no date when this system could be used in production, for now the technique is still developing, although there is the idea, free for any person or company who wants to experiment using gel and raw materials such as rubber, foam or plastic.